The Wamego Hospital Foundation is currently seeking philanthropic support for a new capital campaign. The board will announce the project on May 2, 2019. Stay tuned! 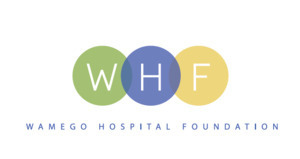 The Wamego Hospital Foundation is a non-profit 501(c) 3 organization which procures philanthropic support for Wamego Health Center. The most recent success by the foundation was a $500,000 campaign to help fund the renovation and expansion of Wamego Health Center. The board wants to thank the community and donors for supporting the Wamego Health Center’s $11 million expansion project. The project saw over 9,000 square feet of new space added and significant renovations to more than 14,000 square feet of existing space. Every department in the facility was impacted by the project.Your belief in Wamego Health Center helped the hospital earn the 2019 Impact Award from Wamego Area Chamber of Commerce. Wamego Hospital Foundation Board officers are Amy Flinn, Chair; Dr. John McQuillen, Vice Chair; Tina Rockhold, Secretary/Director; Brian Lull, Treasurer. Members include Lanny Bosse, Jeff Kohlmeier, Steve Land, Jake Pugh, and John Watt.